Scanned with HP Deskjet F2410. I scanned both magazine cover and shitajiki (i.e. pencil board) which have the same image, and decided to use the magazine scan instead as I thought it looked better than the shitajiki scan (^_^'') The dimensions are also bigger (^_^) Retouched as always. I also removed most of the kanji on the right, leaving only the series title. Watermarked edition (i.e. scanner's credits) is on zerochan. It looks awesome!^^ The detail is really nice. 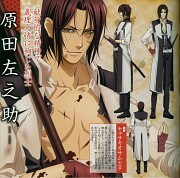 Thank you for the new scan, Hijikata's the MAN! 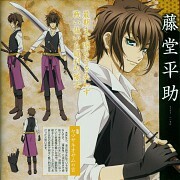 I'm not really a big fan of Hijikata, but in this picture he looks awesome! Oh my gosh! It's absolutely gorgeous. This is love! Thanks so much for scanning this! It's a beautiful picture. I've never saw so many hot guys in one series. 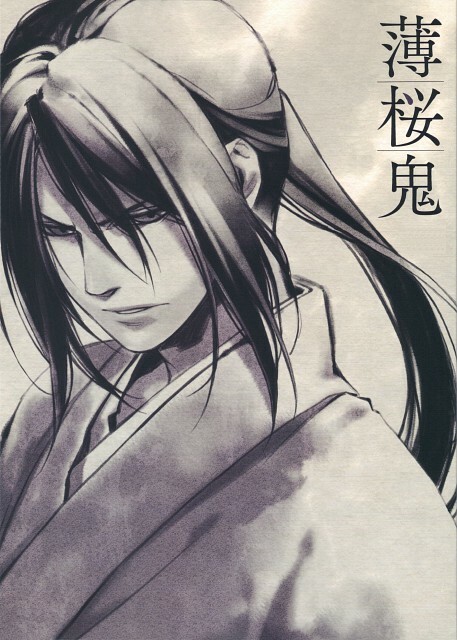 I'll have to look for it because it seems to have some of the elements that I like the most: Amazing art and Samurais. Let's see if the plot is as good as the quality of the art. Thank you very much for sharing!